Vasundhara Raje's toughest test: Will she be able to hold on to her crown in Rajasthan? Vasundhara Raje faces her hardest political fight tomorrow. Many are hoping the Maharani will lose. But will she? Ever since she led the BJP to a sweeping victory in 2003, Vasundhara Raje has been the prime focus of Rajasthan’s politics. In the 15 years since she become the first woman chief minister of the desert state, Raje has faced several ups and downs — but she has never looked as vulnerable as she does now right now. In a sense, history itself is poised against Raje as people in Rajasthan haven’t voted the same party to power for two terms in a row in the past 25 years. With most opinion polls giving a distinct edge to the Congress, there is palpable anger among the people against the Raje government. 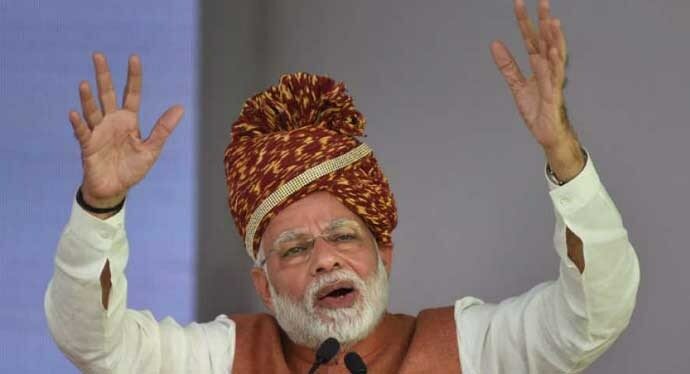 The public mood can be sensed from the slogan that has been echoing in the state this election season: “Modi tujhse bair nahi, Vasundhara teri khair nahi" (Modi, we have no problem with you, but Vasundhara, we won’t spare you). No wonder pollsters are predicting that the BJP may suffer a jolt as many voters seem keen to teach Raje and her loyalists a lesson. The big question is — can Raje buck this trend and return to power? There are no easy answers to this seemingly simple query. A brief analysis of Raje’s strengths and weaknesses may provide vital pointers to her chances of survival. 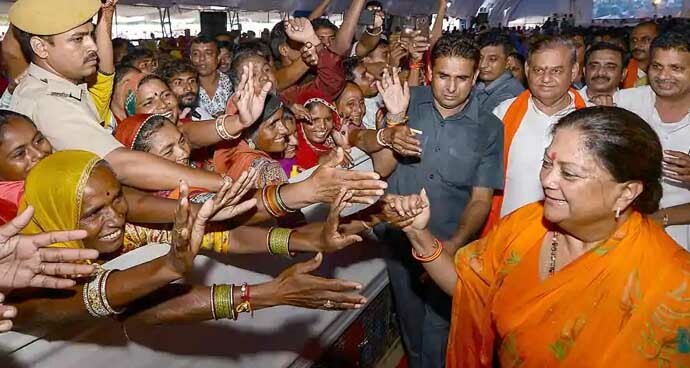 Looking at Raje's strengths, it seems her royal charisma has helped her create an enduring bond with the masses — and being the first woman CM helped her establish a special connect with women voters. It was under Raje's leadership that the BJP formed a majority government on its own in Rajasthan in 2003 and she was the mascot that propelled the BJP to 163 seats in the 200-Assembly, a feat never achieved by any party before. Besides poll successes, Raje has been seen as a dynamic leader with a modern vision, who can take the state forward despite its deeply feudal roots. With her experience as a two-time CM, Raje is now a seasoned leader and the entire BJP campaign has been built around her strong and flamboyant personality. Raje’s recent tenure, however, has been a troubled one where, besides her old rift with the Rashtriya Swayamsevak Sangh lobby, she’s been handicapped by a widespread perception that she is no favourite of the Narendra Modi-Amit Shah combine. The belief began to take root soon after Modi became the PM, but apparently chose to ignore the ministerial claims of Raje’s son, Dushyant Singh, a three-time MP from Jhalawar. Party insiders claim the BJP’s top brass does not have as much faith in her as they do in many other CMs of the party. Earlier this year, Raje’s purported tussle with Amit Shah, over naming a new BJP chief in Rajasthan, was perhaps the most overt instance of the undercurrent of tension that many say runs between Raje and the Modi-Shah duo. Even the tricky task of ticket distribution apparently rekindled Shah-Raje frictions though ultimately, the chief minister was reportedly given a free hand in choosing BJP candidates for the Rajasthan polls. All this has created a strong perception though that Raje isn't a favourite in the Delhi Durbar. A direct result of this state of affairs has been the air of uncertainty that has been hanging over Raje’s own political future right through the past five years. Given this uncertainty, a sense of drift and indecision afflicted the Raje government and created an impression that she is a non-performer. Inevitably, Raje has been unable to live up to the huge expectations of the people who gave her a historic mandate in 2013. 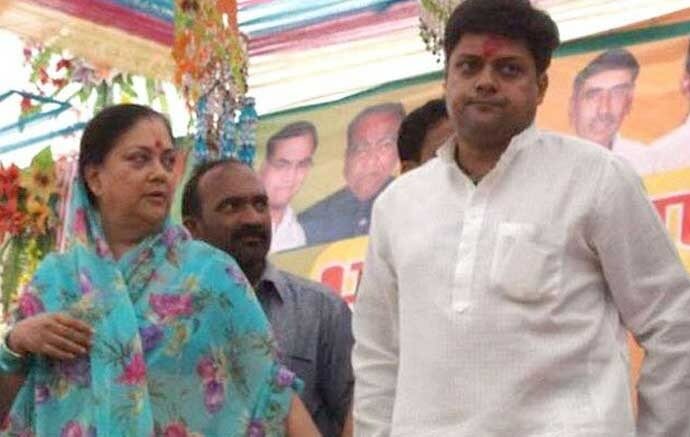 Another major problem is the perception that Raje is surrounded apparently by a coterie that doesn't allow her to establish a better connect with not only ordinary people, but also BJP leaders and cadres. She is often seen to rely on a small group of people from her staff and the civil services. But as many in this closed circle are motivated by narrow concerns, Raje is often seen as cut off from reality and hence, unable to gauge the public mood or address grievances at the grassroots. Inevitably, governance has suffered. Despite her modern outlook, Rajasthan has hit the headlines for polarising agendas that have seen repeated cow lynchings as well as divisive efforts of rewriting history to stir the communal cauldron. Far from providing the 15 lakh jobs that she promised, joblessness has been a constant nightmare for the state’s youth; and while farmers in Rajasthan committed suicides probably for the first time, there was little effort to provide succour. Beyond the right-wing tilt and the governance deficit, serious corruption charges also tainted the administration. Besides other bureaucratic bunglings, senior IAS officer and principal secretary for mines, Ashok Singhvi, was arrested in 2015 in an alleged case of graft involving Rs 2.55 crore. Singhvi, once known as a Raje favourite among bureaucratic circles, was jailed for over seven months on charges of masterminding the massive bribery racket in the mining department. What created greater embarrassment was 'Lalitgate' — where Raje was accused of helping close friend and now-fugitive Lalit Modi to apparently evade the long arm of the law. The opposition demanded Raje's resignation in 2015 after a letter with her alleged signature emerged in which she reportedly backed Lalit Modi’s immigration application in the UK. The issue created a huge controversy — and predictably, impacted Raje’s image. Even caste equations now seem to be tilting against Raje and the BJP as the Rajputs, once a loyal vote bank of the party, are also reportedly angry with the Raje government over several issues. From mishandling of the Padmaavat film row to the non-appointment of Gajendra Singh Shekhawat as state BJP chief, the Raje government has ignited the ire of the martial community. 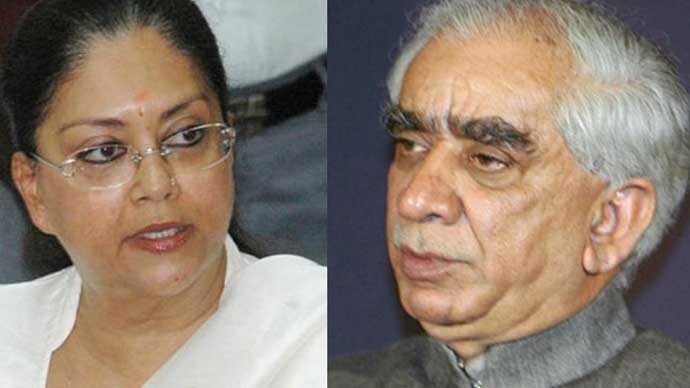 Of course, Raje’s running battle with BJP veteran Jaswant Singh, apparently denied the Lok Sabha ticket in 2014 at her insistence, had spurred the initial frictions with the community. Many feel that Jaswant’s son Manvendra has now been fielded against Raje precisely to encash on the Rajput backlash in the electoral arena. In fact, the ‘humiliation’ of Jaswant Singh is being played up as a matter of ‘swabhimaan’ or self-respect to galvanise Rajputs to dislodge Raje. Known as a feisty fighter, Raje is thus fighting hard and strong, despite the multiple forces ranged against her. In a last-ditch effort, she and the BJP are putting up a spirited challenge to reverse the anti-incumbency that’s built up against them. For Raje though, this is a make-or-break election. If the BJP loses, knives will be out to harm her political future — but if she ensures a victory, her stature will rise sky-high. After purportedly getting her way vis-a-vis Amit Shah twice, her loyalists even claim she could well be a challenger to Modi in case of a hung Lok Sabha in 2019. Clearly, voting on December 7 will be a high-stakes battle for Raje and explains the high-decibel campaign that she has run in Rajasthan. While she’s undoubtedly the Big Boss of the Rajasthan BJP, political pundits say her chances of reversing the historic trend of changing governments every five years is going to be a different ball game. Author is a professor of journalism. He currently heads the Department of Mass Communication at the University of Rajasthan. He is a veteran journalist, an acute observer of politics and worked as Resident Editor for Star News and NDTV in Rajasthan for nearly two decades.